I am happy to be joining in on Nina's blog hop for her Lord of the Season stamp set! This is a great set and it can be used all year long. I used my favorite image from the set tonight, the Butterfly Topiary! I found the perfect DP in my Basic Grey 6x6 Offbeat pad so I used that for my color theme. I colored the image with my Copic markers. Thanks for stopping by!! This is fantastic, Janice! Love that punched butterfly border. so Awesome Janice! I love how you did the butterflies on the side too! Pretty colors Janice!!! I like how you did the punches, cool!! The colors are so pretty! Thank you for sharing. So pretty! I love your edge design with all those sweet butterflies. Very pretty Janice! I love the butterflies and the colors you choose. Ohhh just so sweet and beautiful!!!! I love that butterfly border!!! What a sweet, beautiful card, Janice. I love the butterflies on the side. That lacy border is so beautiful, and the designer paper and butterflies carry the theme throughout so wonderfully! Lovely card! Love the delicate, lacy details! Your card is so gorgeous, Janice! I love the pretty punched borders with the butterflies! The topiary looks beautiful! beautiful...so victorian! love the row of butterflies....great job! Janice, your card is so pretty!! I really appreciate you joining in on the hop tonight!! Thank you for your eyecandy for us!! This is so beautiful!! Great colors and love those butterflies!! Janice , just beautiful ! 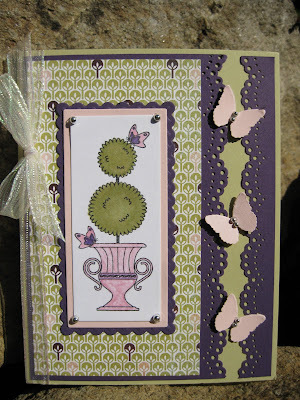 I love the colors you chose and the scalloped edges with butterflies perched ! lovin your colors and those butterflys! very pretty!!!! !